Temple Mount organizations warn Israel is backing down from its demands that Temple Mount security cameras document mosque incitement. 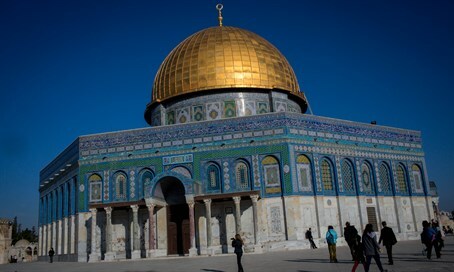 A Jordanian team arrived in Israel on Sunday, with the goal of installing surveillance cameras on the Temple Mount in the coming days, Jordanian Waqf Minister Hail Daoud told Jordanian media. The Jordanian Minister said that technical teams have already arrived at the Temple Mount in order to carry out technical and operational testing and determine where to place the cameras. They are scheduled to install the actual cameras later this week, he added. An agreement between Israel and Jordan to place the security cameras was brokered in October by Secretary of State John Kerry, and stipulates that 24-hour security cameras covering the entire site would be installed in the compound, which is sacred to both Jews and Muslims. But the project has yet to be implemented, and earlier this month there were reports that there were disagreements between Israel and Jordan on several issues, causing the delay. Meanwhile, Jewish Temple Mount groups that have been following the reports from Jordan said Sunday that a Jordanian expert, who was interviewed by the Al-Rad network, said that a Jordanian delegation is traveling to Jerusalem to examine the final stages of the installation of cameras outside the Al-Aqsa Mosque. According to the organization, the comments are a sign that Israel backed down from its demand that the cameras also be placed inside mosques, in order to be able to track the terrorist activities and incitement inside them. The Jordanian expert who was interviewed stressed that "the installation of the cameras is being carried out in accordance with the request of Jordan, not Israel." He further added that "this project is under the supervision of the Jordanian Ministry of Religious Endowments in order to protect the mosque from harm from the occupation". Jordan has insisted that the cameras be installed in the Temple Mount compound and they would document the compound around the clock, with the footage being exposed to the public through the internet, but has also insisted that the goings on inside the mosques not be documented by the cameras.